One of the main reasons for developing and publishing apps into the Marketplace is to drive downloads and adoption of your app. The Marketplace enables you, as the developer of your app, to get detailed reports about the number of views, downloads, and installations of your app(s). To access these metrics, navigate to Home → App Manager → Apps, click on the Actions button next to the app for which you want metrics, and select the Metrics action. The view shown above is the default metrics view for a single app. Across the top is a list of data series options (Views, Downloads, or Installations). Below that, a date range can be chosen. In the middle, a graph is shown for the data within the date range. Finally, the same data that is graphed is also shown in tabular format, in case you want to know the exact values making up the graph. The different types of data available to view are described below. When someone searches or browses the Marketplace, they click on apps to see detailed views of the apps they’re interested in. 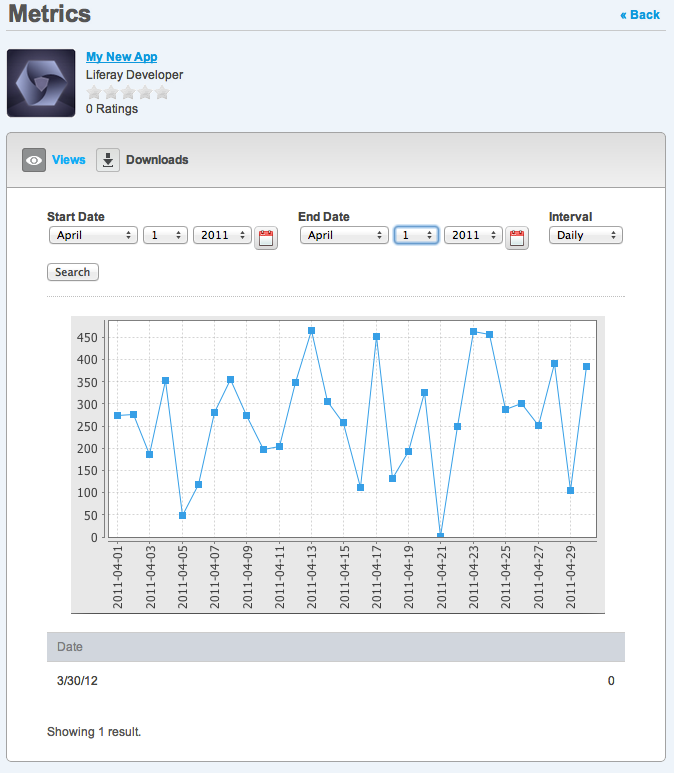 When this occurs for your app, a View is recorded for the app, and this data is what is shown on the App Metrics screen when Views is selected at the top. Views is also the default view, as shown above. The number of recorded views per day per user is unlimited. A download is recorded for your app when someone downloads a specific package of a specific version of your app. The number of recorded downloads per day per user is unlimited. The Marketplace does a best effort in recording installations of your app on Liferay instances. When a Liferay Administrator installs your app via the Liferay Administration console (Control Panel), an Install is recorded for your app.